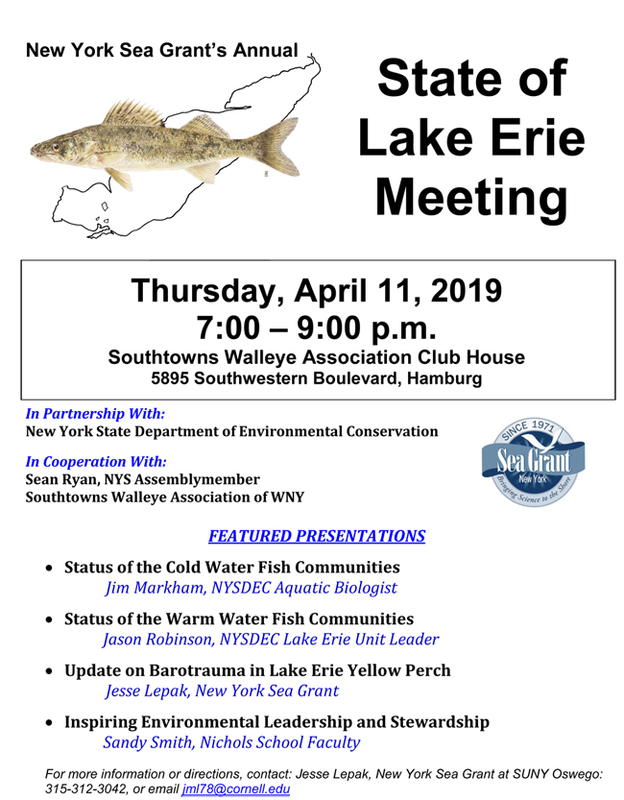 Hamburg, NY, March 21, 2019 - New York Sea Grant (NYSG) and the New York State Department of Environmental Conservation (NYSDEC) will present the annual State of Lake Erie Meeting on April 11, 2019 from 7:00 p.m. to 9:00 p.m. at the Southtowns Walleye Association Club House, 5895 Southwestern Boulevard, Hamburg, N.Y. The event is open to the public and is held in cooperation with New York State Assemblymember Sean Ryan and the Southtowns Walleye Association of WNY. 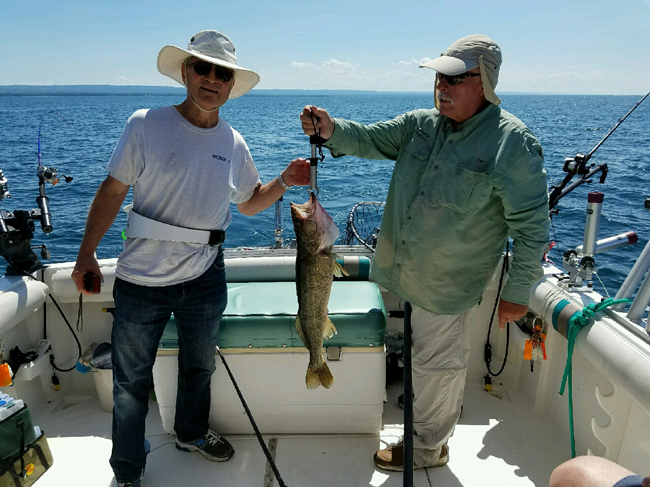 A walleye catch on Lake Erie. Credit: Chautauqua County Visitors Bureau. Featured presentations include NYSDEC Aquatic Biologist Jim Markham on cold water fisheries, including rainbow trout, and NYSDEC Lake Erie Unit Leader Jason Robinson on warm water fish communities, including walleye and yellow perch. NYSG Fisheries and Ecosystem Health Specialist Jesse Lepak will provide an update on how fisheries managers, educators, and angling associations are addressing barotrauma. Barotrauma is the tissue damage caused by the rapid expansion of the swim bladder of the fish when retrieved from deep water. NYSG co-sponsored a workshop with international fisheries experts in 2018 to address barotrauma in Lake Erie yellow perch. Sandy Smith, a member of the science faculty at the Nichols School, a nationally-recognized college preparatory school in Buffalo, N.Y., will share a case study about inspiring environmental leadership and stewardship in youth. A complete agenda is available here (pdf). For more information or directions, contact NYSG's Lepak: email jml78@cornell.edu or call 315-312-3042.